~ Get an organized book list in one location and get it fully "entered"
* DONE! I decided to use one app called GoodReads. The best part is, you can use it on a phone, tablet, or computer. I highly recommend it. And if you are on GoodReads, look me up! ~ Improve my sewing skills. My ultimate goal is to learn how to quilt. * Nothing new - I plan to scour some yard sales to find a drafting table, that way I can set everything up and be more apt to actually sew. * We are regularly going to the gym and meeting with our trainer. ~ Pay off my credit card. Enough said. * Plugging away at this. ~ Walk 10 miles per week. * I have discovered that I am not a fan of running so this is getting put on the back burner. ~ Read 24 books (I have chosen 12 books to read individually and I will read 12 books through my book club). And if I don't reach my goal with this list, plus book club books - don't worry, I still have a "Want to read" list that keeps growing every day! ~ Learn to can food - Had a lesson, now we have to do it on our own. April: Basbousa - To go with our Book Club's Saudi Arabian theme, I asked a Saudi friend to send me some recipes. This turned out pretty good. Hopefully I can get the recipe typed up soon in case you want to try a new dessert recipe. ~ Visit the Wizarding World of Harry Potter!!!!!!!!!!!!!!!!!!!!!!!! * Planning to go for our 5 year wedding anniversary in September! I'm so excited! Feb: Community Q BBQ, Front Page News, Cafe Sababa, and I went to the Melting Pot for the first time with some friends. April: I can't believe this but we actually didn't eat out much this month and none of the places were new. Wow. ~ Try a new hike per month - this has not been happening so I am going to officially take this off the goal list. I have been terrible about blogging and some of my goals but I wanted to make sure I jotted down what I/we have been accomplishing. 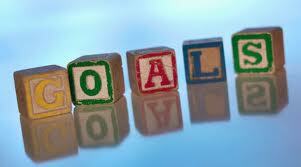 How have you guys been doing with your goals?? ~ Make homemade laundry detergent - I have wanted to try this for a few years now, so now it is officially on the goal list. ~ Make homemade hummus. I have only recently come to enjoy hummus. Now that I have, I want to try to make my own. * Almost had the opportunity this month but we ran short on time. * I cut out a pattern for a new purse/bag but have not had the chance to move forward. * This hasn't been perfect this month. Hopefully May turns around. ~ Learn to can food - My parents came to visit so I made my Dad show me how he cans, YAY! We now have 11 jars of strawberry jam that I can't wait to try. And now that we have seen how easy it can be, we are ready to give it a go by ourselves....so excited! * Doing good so far! Other than that, I have been getting used to the new job which has been tiring but GREAT! I am so thankful for this employment. That's all she wrote folks! I wanted to get an update on our goals posted today but the new job has been keeping me busy and I worked a split shift today and have an early start tomorrow. Sooooooo, the post has to be put on the back burner. Hopefully I will get it up tomorrow! I hope you all had a great month of April and can you believe that May starts tomorrow?! Unreal! ~ Improve my sewing skills. I bought a sewing machine a few months back and I have been slowly learning how to use it. My ultimate goal is to learn how to quilt. * I spent some time at the 2012 Sewing Expo and picked up a beginner's pattern to try. * Right now I am walking/jogging and average of 5-6 miles per week. 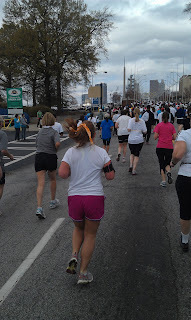 * Ran about 3/4 of a mile at the Hunger Run/Walk on March 11th. March: Queso - no real recipe was used. Dr. Bob looked a few and then created his own. It was quite tasty. ~ Try a new restaurant per month - we live in such a Foody area, it is actually impossible to only keep it to one per month. ~ Try a new hike per month. We did not get to explore anywhere in January but we did try a new local path just last week so we met the goal in February. Not really anything in March. This doesn't really have to do with cooking, recipes, or dessert but it does support the Atlanta Community Food Bank which feeds many, many, many mouths across Metro Atlanta. I set a goal to run a 5K in 2012. I did not reach that goal yesterday but I had a good time trying. I knew I wasn't going to run the entire thing. I have not been training for all that long. It wasn't realistic. My goal for the run was to do half of it running and half of it walking. That didn't happen either. I have been battling a long term cramp in my left calf muscle. It's a beast. It shows up at the most inopportune times. I'm not making excuses for my lack of running but a cramp is a cramp and there is only so much I can do to try to fix it before race day. I tried my darndest. The other reason I did not meet my 1.5 mile challenge was because I did not spend enough time training outdoors for this race. Running on a treadmill and running outdoors are two completely different things. I have learned that now. I will work on this for the next race. I do think the ACFB could have worked a little harder though to get a more level race route thank you very much! :-) Good lord were there slow incline hills. I hate hills in general but I hate slow incline hills even more! 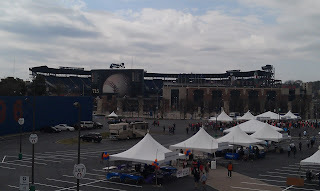 The race started and ended at the site of the old Braves Stadium. It's a parking lot now but they paid tribute to the old field by re-creating the original baseball diamond in bricks. The event had all sorts of activities and entertainment to enjoy. It was a lot of fun. That's Turner Field in the back. 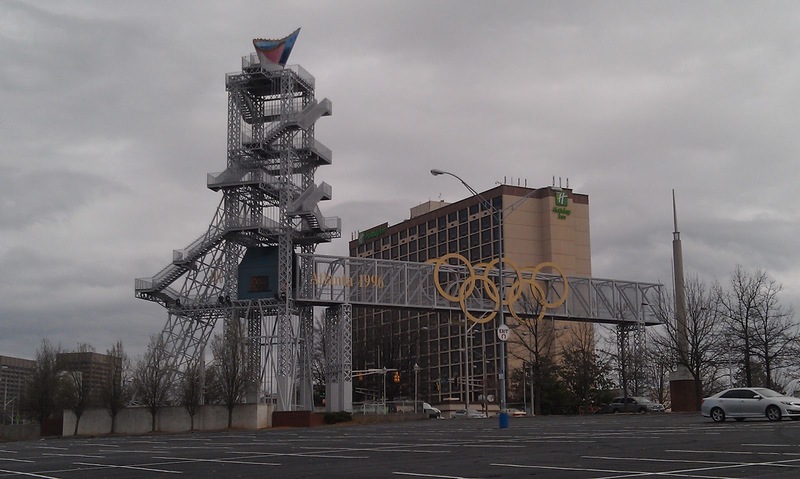 For all the Olympic enthusiasts out there, Turner Field was built for the 1996 Summer Olympic Opening Ceremonies. It later became the new home of the Braves. 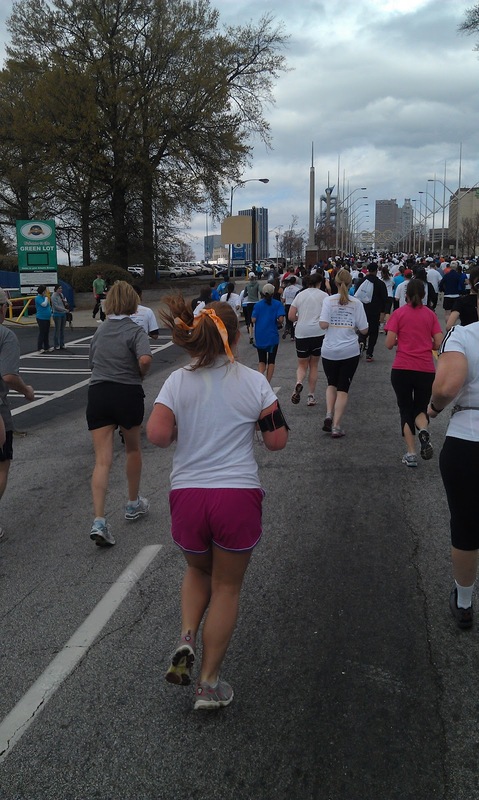 The race started on the main road between the parking lot and Turner Field. We took an immediate left and was able to run past the Olympic cauldron. I am such a geek when it comes to the Olympics! It is so fun getting to see the sights even though the games took place 16 years ago. 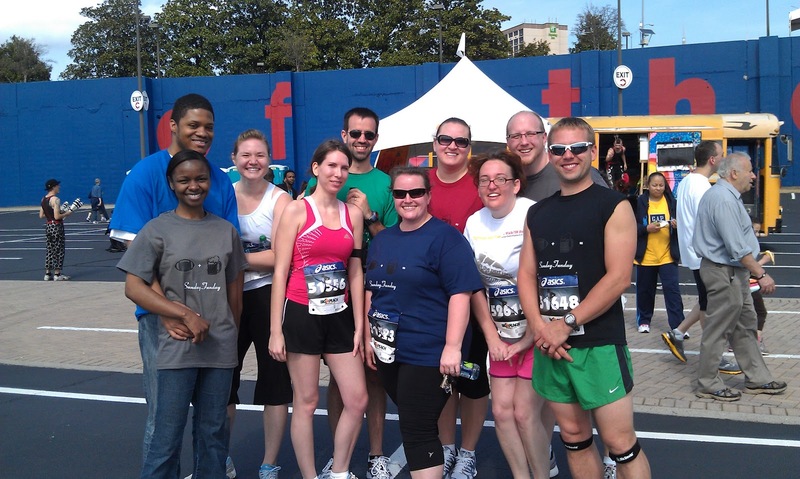 Between runners and walkers, there were over 15,000 participants. The crowds of people just kept coming and coming. It was unbelievable and inspiring! 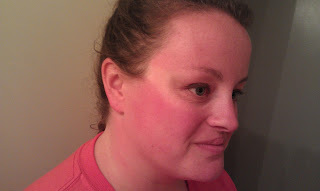 Word to the wise though - when you are outside for 4 hours in March in Atlanta....don't forget the sunscreen or choose to leave the sunglasses in the car! Dr. Bob and I are pretty red at the moment. Oh dear. So now that reality has hit, I know what I need to work on, how to train a little better, and how to take care of myself a little better. Plus it also helps that we are meeting our new trainer on tomorrow so hopefully he can help me get some of this extra poundage off which will increase my ability to run exponentially. The next race I have in mind is April 22nd. I think my goal for that is to be able to run half the race. Then I will set my sights on a third race where the goal will be to run the full course. Do I have a green thumb? The answer has always been a resounding "NO!" But I am hoping to change that this time around. Mainly because I am not fully in charge of the growing. I am an apprentice of sorts. I have dreams of having luscious gardens, backyard animals, whole meals made from scratch - oh I could go on and on about it. But I will save that for another day. Right now I am taking the first steps and starting to get my hands dirty. Dr. Bob and I live in an apartment complex with no room for growing so I have to go elsewhere. Sure I could look into securing a spot in a community garden - but I really have no clue how to get a garden started. Enter my local homeowner pals. It came up in conversation with one and I was totally game, then I asked another and possibly another. I am going to spend this growing season assisting with 2, maybe 3 gardens so I can take notes, learn techniques, and experiment for my future garden. I am super excited! 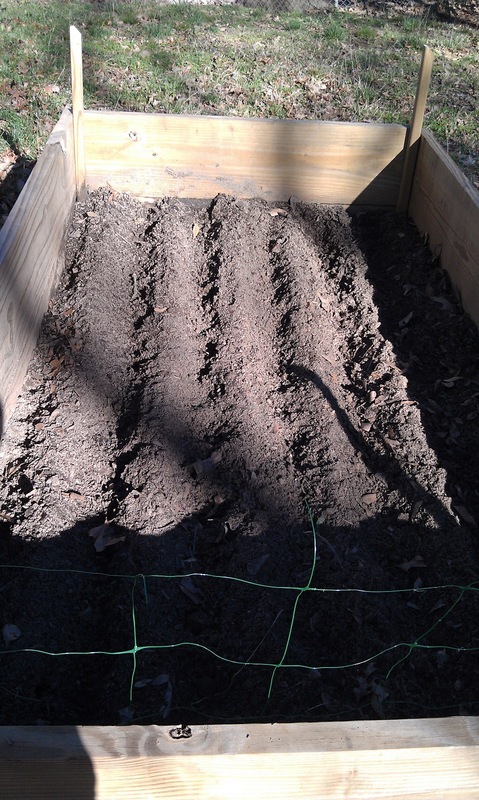 In these raised beds you will find: 4 different types of peas, 3 types of swiss chard, lettuce, mesclun, kale, and 2 types of carrots. Then Cicely indulged me a little so we experimented on something I found on a blog - a potato box! Apparently this sucker can yield up to 100 pounds of potatoes and only takes up a 4 square foot area in your yard! I lurv me some potatoes. If this turns out to work well, I am going to have these suckers at all of my friends houses and we will be doing multiple plantings of these. According to the article (which was written in Portland or Seattle - much different climate up there), you can plant potatoes in April and again in August. Here in GA they say you can start as early as January...we could have backyard potatoes all year round! I am crossing my fingers that these Yellow Fin potatoes are a success! I learned that these items went in her backyard because they were considered "cool weather plants." Her backyard does not get a ton of sun so that is why they are grown back here. 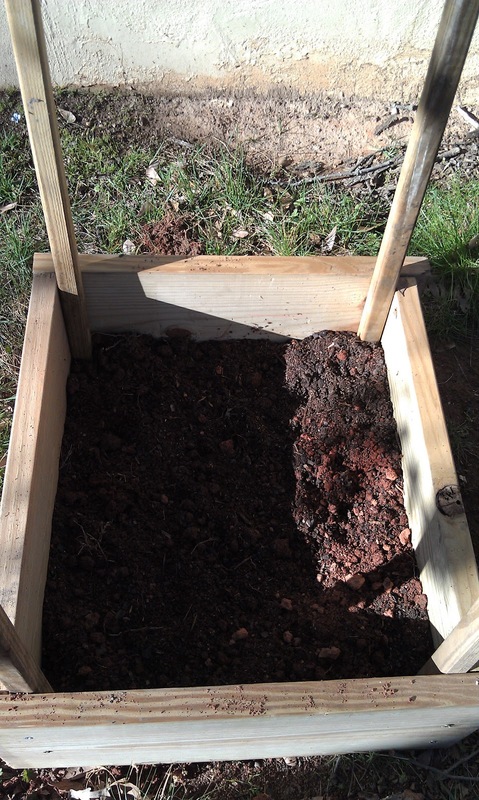 The front yard is where she has 2 more raised beds which will be home to those items needing lots of sun. We are getting together next Saturday to tackle those raised beds. Okay back to the planting. 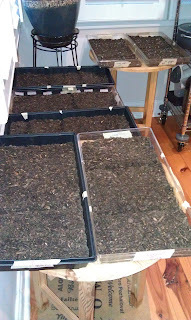 Next we needed to get some seedlings planted. Technically we could have started them at least a month ago but we are all still getting used to the seasons down here (Cicely moved from Boston about 1.5 years ago so we are both not used to such an early start time) - better late than never I say! We are trying a method where we plant the seeds in trays to get started, then when they start to sprout, we will thin them out into their own little containers to finish growing before they are put in the ground. Here you will find: a variety of tomatoes, eggplant, celery, cauliflower, basil, thyme, parsley, lavender, sweet peppers, hot peppers, jalapenos, and tomatillos. We called it a night after that because it was getting late but the day was a lot of fun. 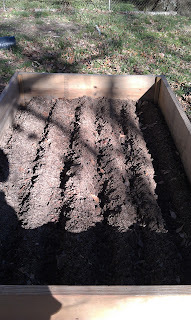 This upcoming weekend we hope to get the raised beds in the front yard cleared out, prepped, and planted (as much as we can until the seedlings are ready, that is). This is such a fun new adventure for me. Thanks Cicely for allowing me to help! We had 7 of our favorite people over for a Mexican FEAST last night. We tried some new recipes as well as stuck with some classics. We had a great time. We always try our best to clean up a majority of the kitchen when we have dinner parties but we weren't able to get through everything last night. I woke up this morning and that's when the light bulb went off. 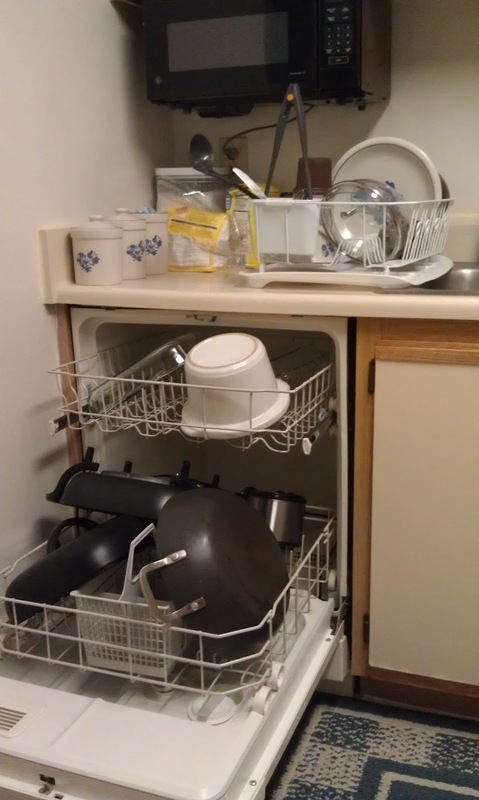 We have a dishwasher that we rarely use but why can't we use it to dry all of our big dishes?? Why haven't we thought of this before?!?! 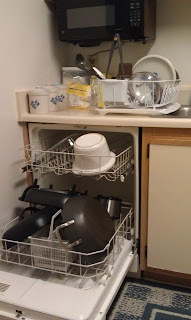 What would have taken me all day due to the small size of our dish drainer, is now complete in one wash. This is AH-mazing! Have you done this before?? Do you have other simple solutions to share?? Since family and friends have been asking us for our recipes (constantly and repeatedly), we are going to do our best to show you what we've been up to in the kitchen. We often find recipes online or in cookbooks that we modify to suit us. We'll always give credit where credit for the heavy lifting is due, and will do our best to document how we made them our own.